Sediment Filters are designed to remove physical particulates from your water. Learn how to pick the right filter for your needs. Tier1 is here to answer your questions. Sediment Filtration: What is the right filter for you? Clean drinking water is vital for health. If there are harmful substances in your water supply, home water filtration is the solution. Suspended matter like sand, dirt, rust, loose scale, pipe corrosion, clay, and other organic materials can be reduced by sediment filters. Sediment can make water look and taste unpleasant. It can also clog plumbing and appliances, and leave stains on clothes and fixtures. Sediment filtration ensures water is free of physical particulates, helps appliances work better and longer, and makes drinking water clearer and better tasting. Sediment filters are typically composed of one of two materials: cellulose or polypropylene. Cellulose filters are manufactured from cotton fibers, treated to contain a cellulose content of 98%. Polypropylene is a plastic-based, synthetic media. The choice of cellulose or polypropylene depends on your water source. Households with an untreated water source such as a private well require polypropylene filters. Because cellulose is an organic plant fiber, microorganisms can live, grow, and feed off it. Polypropylene is made of plastic which makes it bacteriostatic, meaning that microorganisms will not live or grow on it. 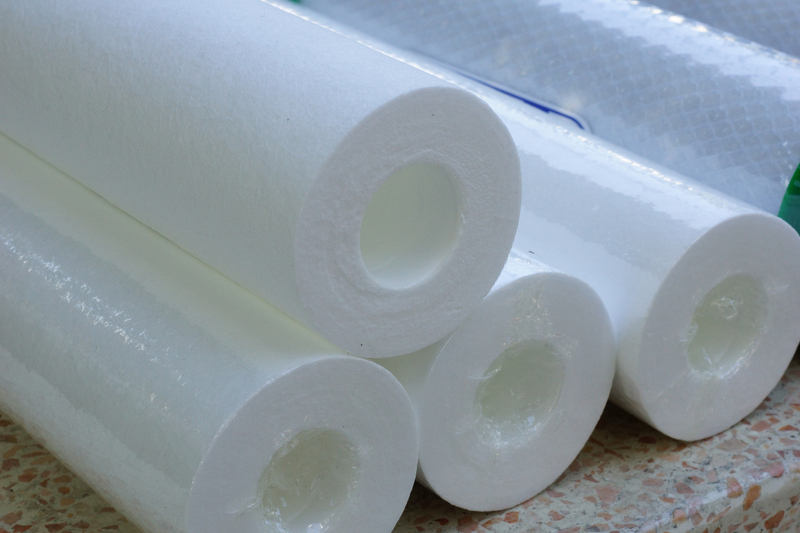 For treated water, either cellulose or polypropylene filters can be used. Sediment filters are available as string-wound, pleated or spun-wound cartridges. String-wound filters look like a spool of tightly wound string. The string changes in thickness by layer, so the outer layer traps the largest particles, ultimately getting thinner to the center, which has the rating (eg. 5 micron) of the filter. Spun Polypropylene filters are melted and blown out of a gun and spun onto a cartridge. As with string wound filters, the outer layers trap the bigger particles. Pleated filters offer higher flow rate, lower pressure loss, and more surface area. Polypropylene pleated filters can also be washed and reused. To filter water for an entire home, install a point of entry system at the main water source. When water flows through a sediment filter, particulates are trapped in the filter. Sediment filters are often used as a pre-filter for other water treatments such as carbon filtration. By trapping larger particles, sediment filters extend the life of subsequent filters in the system.